It's Olena here today to share with you a Beautiful Hummingbird card! I made this card using the Super CUTE CottageCutz dies- Hummingbird. 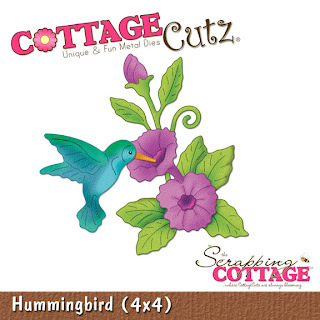 On this card I used the gorgeous CottageCutz Hummingbird die to create my card. I cut out couple times flowers, leaves and bird using different colors of card stock, and then I sponge them with craft ink. Next, I used Zip Dry paper glue to give them a 3-D look. Inside flowers I put glitter glue. I also used Martha Stewart punches, EK Success punch and white gel pen. STUNNING! I love your bird and flowers. I also like vibrant colors. Wow, that is just gorgeous. You made the flowers and humming bird come to life with the pretty shading. BEAUTIFUL!!! Love the beautiful colors,and your humming bird!!!! Gorgeous card Olena!!! Love all the details!!! Absolutely stunning card! I LOVE that die! You are making me want to grab one for myself! Your card is real beauty. Great colours.